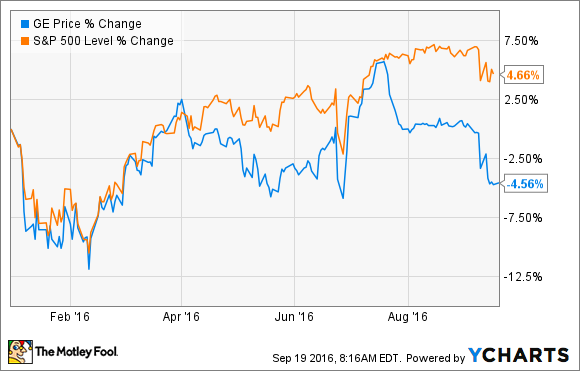 General Electric Company Expects a Better Second Half -- Should Investors Buy It? Five reasons the industrial giant will hit its numbers in the coming quarters. It's been a disappointing couple of months for shareholders in General Electric Company (NYSE:GE). Since the release of its second-quarter results on July 22, the stock price has started to notably underperform the S&P 500. One explanation sees the market doubting the company can hit its organic revenue growth target of 2% to 4% for 2016, especially since organic revenue actually declined 1% in the first half. Here's why the doubters are wrong. Before investors panic about the organic revenue decline in the first half, it's worth noting it comes against a 4% increase recorded in the first half of 2015. Meanwhile, the expected 5% growth in the second half of 2016 comes up against a much easier comparison of just 1% growth in the same period in 2015. The second-quarter results may have underwhelmed investors, but it would be wrong to assume there was any change to management's expectations or aims for the second half. For example, back on the first-quarter earnings presentation, CEO Jeffrey Immelt outlined his expectation for "lining up to be about 5% organic growth, based on equipment backlog profiles." Fast-forward to the second-quarter earnings call, and expectations have broadly remained the same (albeit with Immelt guiding the market toward the lower end of the range): "We expect the second half will strengthen, to be up about 5%. We see organic growth at 2% to 4% for 2016, likely trending close to the bottom end of the range." In discussing how the company could hit its second-half growth target, Immelt declared it was "really a power story." The power segment plans to ship "65% of its gas turbine volume in the second half" and "50% more" Advanced Gas Path solutions (an upgrade applied to gas turbines which creates a 6% increase in output) with "most of these units" in the backlog. In other words, thanks to the backlog, management has a good line of sight as to what will ship in the second half. In a similar vein, Immelt claimed the oil & gas segment's comparables from last year get "less difficult" in the second half, while "we've got about 70%-plus of the revenue for Oil & Gas, based on our forecast of revenue the second half in backlog." General Electric Company will ship 65% of its gas turbine volume in the second half. Image source: General Electric Company presentations. As readers already know, integrating the power and grid assets acquired from Alstom is a key part of General Electric Company's strategy in the next decade. The good news is that management confirmed the integration was on track, with CFO Jeffrey Bornstein expecting the Alstom synergies to "kick-in in the second half." Bornstein went on to declare that only $400 million of the expected $1.1 billion worth of synergies had been, so far, executed in 2016. Meanwhile, management still expects to achieve $0.05 in EPS from the Alstom assets in 2016. As you've seen above, the power and oil & gas segments have been singled out by management as areas set for a second-half improvement. While they are the "swing" parts to the company's growth increase in the second half, other General Electric businesses are already growing at a steady clip. Indeed, Immelt said, "the rest of the company is sustaining organic growth in the 5% range, comparable to the run rate, and this should continue in the second half." All told, there are strong reasons to believe General Electric Company will generate a full-year organic growth figure within its target range of 2% to 4%. However, Immelt nudging expectations toward the lower end of the range will have disappointed some; an act further reminding investors that the global economy remains in moderate growth mode. No matter, General Electric remains on track in 2016.